NCII – Believe in Your Students. Believe in Yourselves. Colleges want to help students reach their goals. In addition to this internal drive, demand for improving completion rates is growing stronger, and external pressure — including accreditation demands, state mandates, and changes to performance funding — is intensifying. Now is the time for colleges to evaluate and strengthen their improvement efforts so every student’s experience is designed for success. 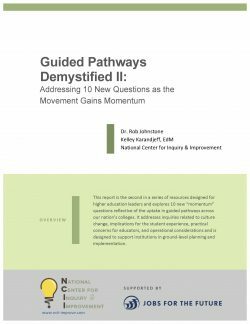 The National Center for Inquiry and Improvement (NCII) is a leader in helping community colleges implement authentic change. We earn the trust of college administrators, faculty, and staff because we understand their work and we have deep experience identifying and removing obstacles to better outcomes. We also are known for our unique blend of energy, passion, and optimism, which helps colleges stick with the challenging work of organizational change.